What I like “bring a plate” functions here in Australia is that people can enjoy many various tasty dishes by just making one themselves. Best still, families and friends can have laughs and chats over the wonderful foods, easily connected in a relaxed atmosphere. Sometimes, we might run out of ideas of what to make and bring along. Here’s a good one. These brownies are one of the popular finger foods in any bring-a-plate gatherings, easy to make on the go. This is a light version, perfect to be served after a meal even with a full stomach, goes perfectly with whipped cream or ice-cream. Preheat oven to 170C / 325F. Line a square baking tin with baking paper and grease the sides. Place chocolate and butter in a large, clean mixing bowl over simmering water. Make sure the bottom of the bowl doesn’t touch the water. Stir the chocolate and butter occasionally until completely melted (as shown picture 1 and 2 above). Remove from heat. Use an electric mixer to beat the eggs, sugar and vanilla extract until pale and fluffy, about 2 to 3 minutes. 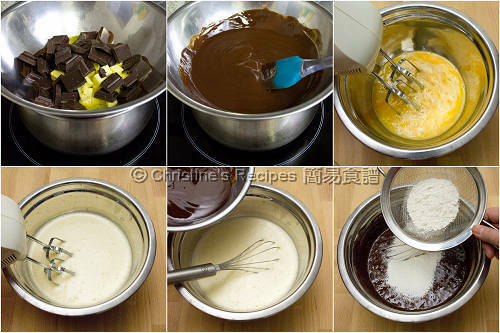 Use a balloon whisk to mix in the chocolate mixture (as the above picture shown). Sift in flour, cocoa powder, baking powder and salt. Make sure not to over mix though. Just to combine all the ingredients. Pour the batter into the lined baking tin. Level the surface with a spoon. Bake in the preheated oven for about 25 to 30 minutes. It’s cooked through if an inserted skewer or needle comes out clean. Let it cool on a wire rack. 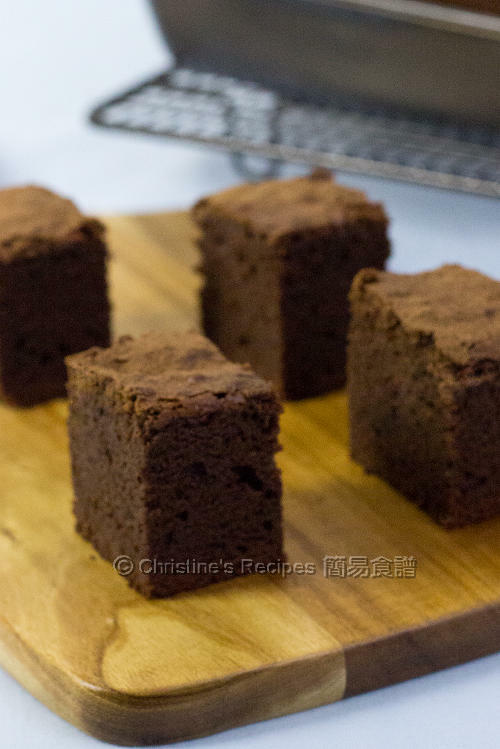 Sprinkle with cocoa powder and cut into squares. Served with fresh whipped cream or ice cream. Add some nuts into the batter, Macadamia nuts or hazelnuts if you like. Yes, this finger food is refreshing after a meal, something sweet yet light! I always love your recipe and I had done tang Zhong bread method successfully. I have a child who is allergic to gluten. May I know if u have any gluten free soft bread recipe ? Thank you for your love of my bread recipes. Unfortunately, I haven't created any made with gluten free flour. Sorry, haven't posted any wholemeal bread recipes yet. I'm with you. The recipes in bread machine manual are not up to our expectation. Hi Christine. how many eggs are used? Used 4 eggs, stated in the ingredient list. Hi Christine.. I follow the instruction on oven 170C and 25 mins. Why my Brownies cake on top layer got burned. The power of every oven is very different. If your brownies got burned, the temperature of your oven was too high. Try to reduce the temperature a bit next time. 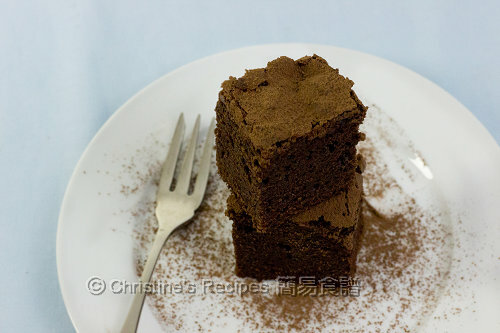 If you see the top getting browned very quickly, and the cake hasn't been cooked through, reduce the heat immediately. Hi Christine, how long can it be kept (in room temperature or in the fridge) and does this freeze well? Thanks! hi Christine, my brownie texture is dry, did i do something wrong? secondly, what is the Best way to store the leftover? i keep it in a Tupperware and makes the texture even dryer. It shouldn't be dry at all. Would be a bit like light cake. The leftover can be kept well in an air-tight plastic container for a day or two and chill in fridge.